Why not start your trip on the very edge of Lofoten? Å is a small town with a long history. Here you can learn more about Lofoten’s best known export, dried fish. At the Lofoten Stockfish Museum, you can trace the journey of cod from swimming in the sea to being bone-dry and ready for the Italian dinner table. Once you’ve had enough of the stockfish, all you have to do is jump back on Lofotekspressen and continue to enjoy the beautiful route until your next stop. 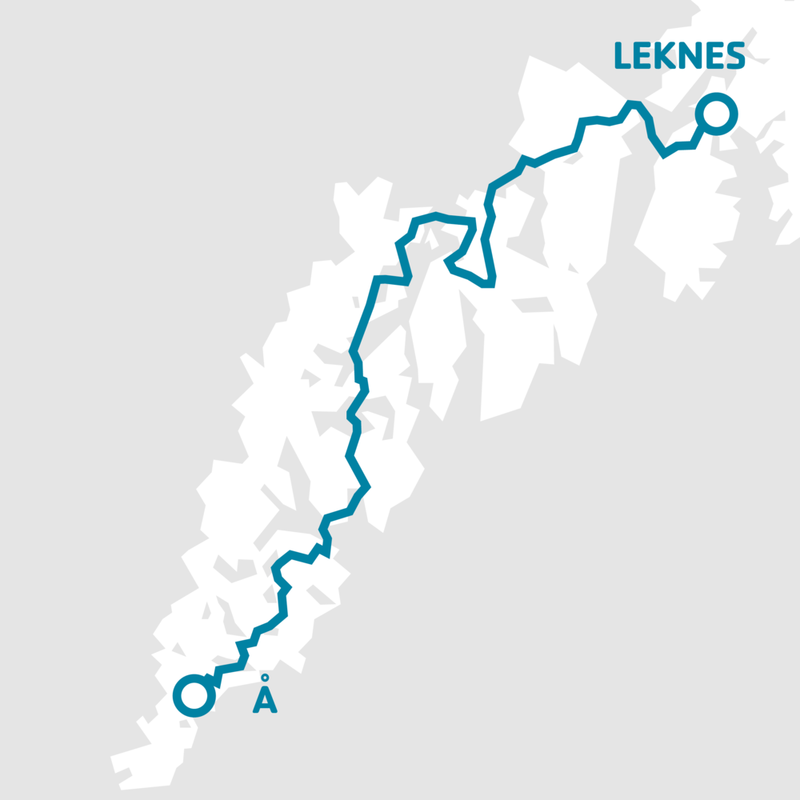 Recommended stops: Å, Reine, Hamnøya, Ramberg and Leknes. Take route 18-772 and set course for Reine in Lofoten. The bus passes Moskenes, an obvious place for many tourists to get on board. This is where the ferry from Bodø lands, and the Lofotekspressen connects with ferry arrivals. We recommend an overnight stay in Reine, which is one of the best known and visited fishing villages in Lofoten. It has been thoroughly photographed, and with good reason. Here you can find breathtaking views at every turn. If the natural landscape is not enough, visit Galleri Eva Harr to see magical art inspired by these fantastic surroundings. When you are ready for new experiences, hop onto route 18-742 and continue your journey on board Lofotekspressen. If you like to keep active, then we recommend at stop at Hamnøya to climb Krykkjeberget. Once your hike is over, you can get back on the same bus route to continue to the world-famous Rambergstranda beach. If you bring a tent, you can pitch it here for an unforgettable night in nature with the midnight sun and the ocean for company. Route 18-742 then continues to the final stop on this trip: Leknes. The airport is located here - so for many people their trip to Lofoten either begins or ends here. The town is a hub of many exciting experiences and you should definitely head out to sea to experience fishing in one of the world’s best-stocked oceans.